The next Magic Keyboard may look something like this. Apple is reportedly in talks to acquire an Australian startup called Sonder that specializes in making keyboards with individual e-ink displays on each key. The Sonder acquisition is supposedly part of Apple’s plan to update its Magic Keyboard in 2018 with a smart keyboard module and color e-ink keys that allow programs to quickly swap characters for shortcuts or change to a different language. An anonymous user on Reddit who reportedly works at Tsinghua University (aka “China’s MIT”) claims that Apple’s keyboard for the new MacBook Pro with an OLED touchpad was on display at a recent demo hosted by Apple’s manufacturing partner Foxconn. The new MacBook Pro keyboard has been rumored for months. Cult of Mac published spy shots that confirm it will have an OLED touchpad that replaces the function keys at the top. However, the Reddit user claims what Apple has in the works for 2018 is even more impressive. Foxconn allegedly allowed attendees at the closed event to type on an early prototype of the upcoming Magic Keyboard that will make dynamic keyboards the new standard for computers, just as the iPhone made virtual keyboards the standard for smartphones. The Foxconn leaker’s employment at Tsinghua University was apparently confirmed by Reddit but we can’t confirm that the keyboard report is legit. Apple could always scrap the project in the end, so take the news with a Trump Tower-size grain of salt. Test models shown by Foxconn reportedly felt as natural to type on as a regular keyboard. 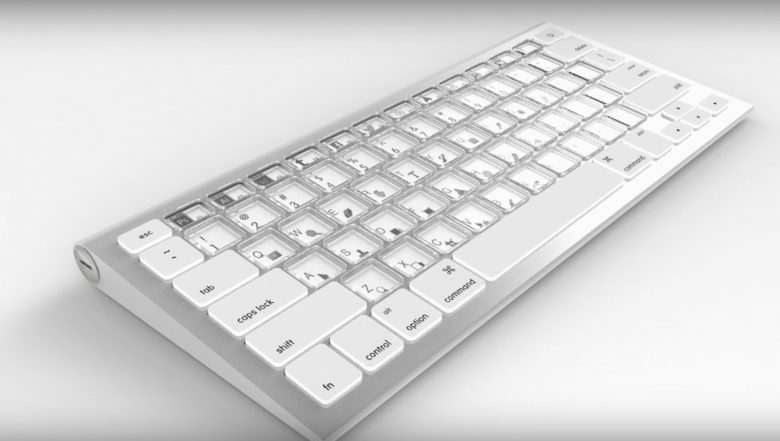 The e-ink keyboard uses magnets and a mechanical structure instead of the butterfly keys Apple invented to make the MacBook keyboard thinner than ever. The demo unit keyboards came in two finishes (jet black and silver). Another impressive feature of the demo unit: a timing controller, similar to that used on the new 5k iMacs. The controller allows the keys to update super-fast like a normal display. There also would reportedly be an SDK so third-party apps could take full advantage of the new e-ink keys. Maybe this means Mac users will finally get a true delete key.